The glow from candles was reflected in the massive windows. Snow swirled behind the glass. People behind him were amusing themselves, but Hyacinth had no interest in dancing with anyone or enjoying himself. He could see no sense in it. These balls, to which his family was invited solely because an old friend owed his father an exceptionally huge favour, existed as an aid to finding someone to marry. Which one of these rich, cultivated men would want to marry him? Almost no one paid him the least bit of attention, and surely he would not have wanted it to be any different. Thus he stood there on the edge of the grand ballroom with his back turned to the people and observed the guests by examining their sallow reflections in the windows. As always, one of them stood out somewhat. With a sidelong glance he noticed Inspector Hathaway stepping onto the stage. His heart skipped a beat when the music stopped ominously. The man had encountered him in the gutters last night, had… had seen him. The chef de police had seen him arguing with the inspector’s weird son. With a suitor whom Hyacinth had spurned as he did each one for months, because he could no longer do otherwise. Breathing heavily, he clutched the back of his father’s chair, who in a few moments would drag him outside and let loose on him. His mother, who was scowling at Inspector Hathaway, would not preserve him from his fate. Rather, she would be happy to finally be rid of him. There were only two ways this matter could end. Either his father would kill him on the spot. Or he would throw him out into the street. In that case, things would be even more noxious for Hyacinth than before. His eyes filled with tears. Tears that he had not wept for years. But at this moment they ardently and fiercely tortured him. Filthy liar! You saw nothing at all! There was nothing at all to see! Inside he was screaming at the vengeful man who perhaps was costing him his life, merely because he felt his pride affronted. Murmurs passed through the crowd. Hyacinth held his breath as the people looked around with curiosity. All of a sudden he sensed their gazes directed at him. Piercing, painful, humiliating. Now the crowd drew sharp breaths and again began to whisper. Hyacinth felt like he would have to throw up on the marble. He felt weak, as if he had imbibed more alcohol to withstand all these things more easily. Suddenly it grew horribly silent around him. His father squared his shoulders and wiped his forehead before slowly standing up. “I’m sorry,” Hyacinth whispered choking back tears and avoided looking into his mother’s eyes seething with hatred. What must she think of him? At the same time it was precisely this, his broken family for which he had degraded himself. “That is a denunciation, Hathaway! Do you have proof of these accusations?” Gavrila Ardenovic intervened immediately and to everyone’s astonishment. Hyacinth cast a quick glance at the ever-ailing, deathly pale man, but saw him indistinctly at best. His rangy fingers clasped around the stem of his champagne glass so firmly that his knuckles stood out by their whiteness. Abruptly his father grabbed him by an upper arm and dragged him out into the cold night. The large man threw him against a wall of dark bricks and slapped a hand over his throat to squeeze it. 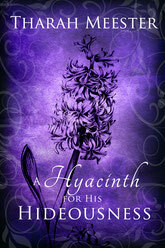 Hyacinth lost all ability to breathe and gazed with shock into his father’s ebon, nearly black irises. She didn’t care about him, only about the good reputation she never had. “Please stop,” Hyacinth wheezed and gave his father a hard shove against the chest. Everything began to grow murky before him. The snowflakes dancing wildly through the air caused him even more intense dizziness. “What were you thinking, you accursed piece of dung?” His father shook him violently and ignored his panicked resistance. Would he actually kill him in front of all these people and the inspector who was likely standing there in the ballroom enjoying his revenge? He wouldn’t put it past him. He wouldn’t put anything past that man. “I only wanted to help both of you.” It was the truth. He had meant well, wanted to procure a little money for them that he couldn’t have obtained any other way. Because he was stupid. Without education, without talent. Everything was spinning ever faster, ever more violently. He would certainly lose consciousness soon and lose his life at the hand of his own father. The man loathed him so much that he would rather kill him in public, and without regard to the consequences, than to throw him out. And it was all one and the same to his mother. As indifferent as the guests were, some of whom followed them outside and others of whom had gathered at the windows, it made no difference to them; they only wanted to witness how this matter ended. And they would do it venomously. “Enough,” a hard, cold voice brought an end to the scene. Hyacinth could perceive the hammer of a revolver being cocked, and in the dead silence that followed, he heard only the pounding of his heart. After a brief hesitation he was unhanded and would have sunk faint to the ground had not a bony hand grabbed for his upper arm and pulled him upright again. Struggling against an approaching unconsciousness, he sank against Ardenovic who intervened as if this matter actually concerned him. Hyacinth’s breath caught short. Ardenovic wanted to take the shame from him? Place him under his protection? What would he gain from that? The crowd murmured angrily, not seeming to believe what it had heard and what was occurring. Just as little as he did. This evening had turned into a nightmare which seemed worse than the many evenings before. And he knew he would not wake up. His fingers were still grasping the black fabric of Ardenovic’s clothing, hiding his face with it on the man’s chest, in which his heart beat much more calmly than it should considering the situation. Ardenovic had slung his slender arm around Hyacinth’s waist and held him firmly. “You want to what?” his father demanded incredulously and his forehead wrinkled with deep folds which made him look menacing. Again the crowd heaved a sigh because this man was prepared to pay for a compromised young man. Hyacinth wished they would all simply vanish instead of listening and further humiliating him. His parents exchanged irritated glances, and his mother spoke: “We accept your offer.” After everything, now it would be her greed that had saved his life. With these words which bore into Hyacinth’s soul, his father turned and took his wife by the arm. Neither one looked back at him again, and although he despised his parents just as much as they him, it hurt deep inside that he meant less than nothing to them. Hesitantly he stepped into the narrow row house which appeared to be cramped between many others. Ardenovic had rung a priest out of bed, and they had exchanged their vows. Now he was standing in a dismal room stuffed full of books, magazines and papers. These objects lay wildly strewn over the floor. The papering had come loose in places on the walls. The windows were completely dirty, scarcely allowing any moonlight through. When Ardenovic lit a lamp, the piles of books cast dark, eerie shadows. “Don’t knock anything over,” the man instructed him coolly. “Into the bedroom.” He pointed with the lamp in the direction of an open door. After a dry swallow, Hyacinth began to move, whereby he had to pay close attention to where he stepped. Places where the floor covering peeked through were rare. At least the small sleeping chamber appeared tidy, so he sat down on the bed. Hyacinth nodded, but this appeared to be hidden from the other man. He felt woozy. Had the moment now come to say that he was a virgin? Should he explain that he only took these chaps in a hand or in his mouth? Would Ardenovic take that into consideration? Fundamentally, he knew the answer. This man would spare him no more than his father had done all those years. “No,” he choked forth and forced back bitter tears. “Good, then put that on and lie down,” the man demanded roughly and handed him a white night shirt. Trembling, he did as he was told and slipped under the covers. Beneath the piece of fabric which offered him no protection. So many nights in which he had believed he could not stand his life due to repulsion and nausea against himself, and then one in which nothing had happened became his doom. For months he had no longer allowed any man access to him. On that night he had been out seeking a drop of absinthe when Hathaway’s son accosted him and was turned away. Ardenovic laid down beside him in bed while he stared stolidly at the white wall. He did not cringe as a cold hand was placed on his hip. The fingers that touched him had a subtle tremble while they stroked over his waist and slipped further down to pull the night shirt up. He proceeded cautiously but simultaneously emitted a sound which let Hyacinth know that he would tolerate no resistance. He explored his thigh and pushed his legs apart. Hyacinth was afraid that it would hurt and attempted to relax. Ice-cold, oiled fingertips moistened his entrance, forced their way into him which he nearly responded to with a sharp inhalation. He was able to maintain control of himself and yielded to Ardenovic when he lay upon him. How could a living body feel so terribly chilled? He cringed under the weight of the man who was cautiously taking possession of him and gasped for breath when he noticed he had urged this man on. Ardenovic moaned as he slid down further and immediately began to cough fitfully. The pain which Hyacinth experienced by being expanded in this manner unfamiliar to him was nearly unbearable, and the shame rendered his cheeks hot. To stifle a scream, he sank his teeth into the white pillows under him. Now the burden of this wishful daydream had been taken from him – Ardenovic took this weight from him by pulling back and thrusting a further time, then breathing heavily while coming inside him. Everything burned within him, and he only wanted to be released. He felt ill, and the world was swirling before him. Not until his husband had pulled back and out of him then lay on his side of the bed did he perceive that he had hardly touched him during their brief time together. A peculiar, never before experienced emotion flooded his body. Tears ran down his cheeks. He wept them without a sound so as not to betray himself, not to let Ardenovic know how terribly weak and despairing he was. Furtively he drew up his legs, wrapped his arms around them, rolling himself into a bundle. He wished he could dissolve into nothing. He didn’t. Instead, he lay the remainder of the night in the strange bed with the strange man, whose coughing and wheezing kept him awake.